It’s no secret among friends and family that we are a Lego loving family. In the past 4 years our collection has nearly tripled in size. 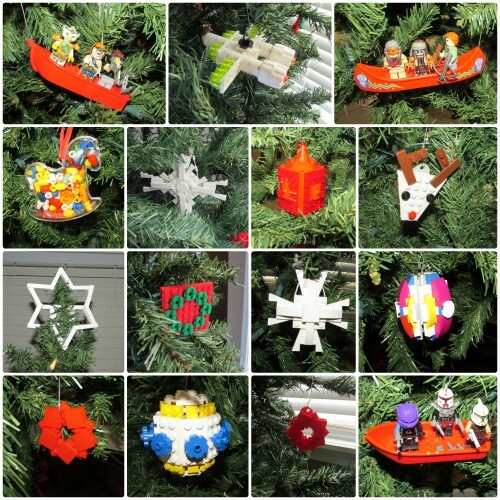 To reflect our love for Legos, this year our Christmas tree is decorated exclusively with Lego ornaments. It took a family effort to create them, thus giving us lots of extra quality time together (sometimes good, sometimes bad LOL) and that’s an extra benefit. Now, lest you begin to throw accolades of how creative we are, let me point out that I am not really a creative person. What I am is a good replicator. 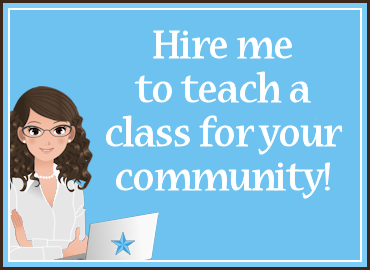 My years of putting on school music programs using borrowed ideas are proof of that! Regardless, we enjoyed most of this process and are loving the result. Here are closeups of the ornaments. Most of these were created or modified from designs by Chris McVeigh. He has a wonderful site with instructions and parts lists, plus he posts lots of neat Lego designs on Facebook. It did take us a lot of time to corral all the right pieces, but since have them sorted by color already that helped. This batch or ornaments were mostly ones that we put together ourselves. You can see our creativity is far less brilliant than Chris’. We did use this reindeer design and this poinsettia design. 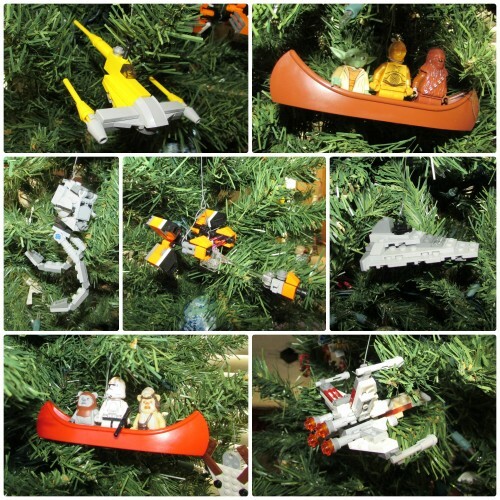 These Star Wars ornaments (excluding the minifigs in boats) were made from sets that we’d purchased for a fraction of retail price a few years ago. Since 40 or so ornaments weren’t enough to fill the tree, we also hung an additional 20 or so minifigs mixed in among the ornaments. We’ve got Cinderella and Prince Charming, Indiana Jones, Batman, lego dinosaurs, horses, soldiers, Chima characters and many more up there. The kids are really loving it and I love that it was a tree built together. It really reflects our family. 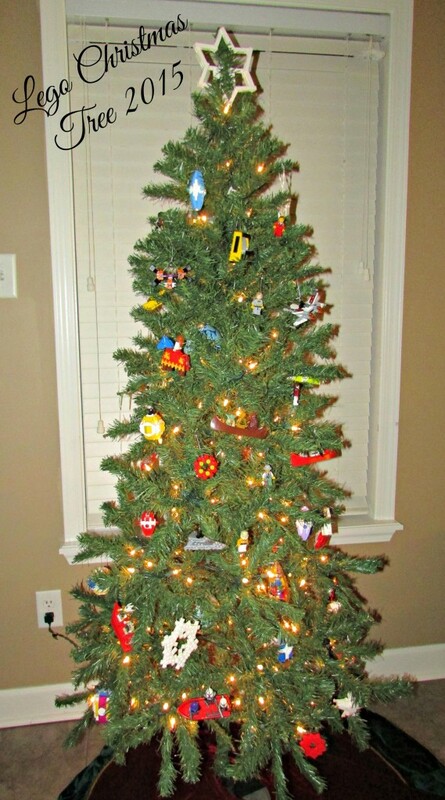 Has your family ever had a non traditional Christmas tree? 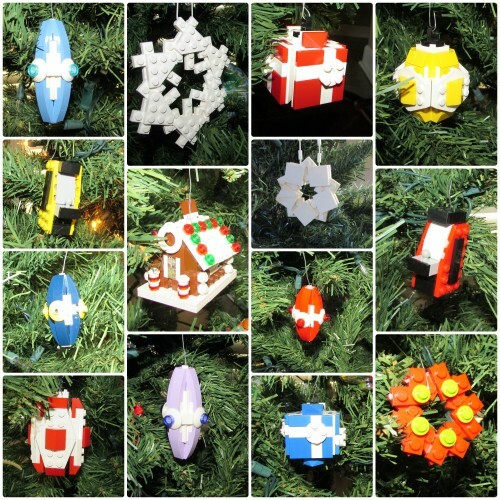 Would you ever consider a Lego themed tree, even if it wasn’t your main tree? Love, love your tree – it is so your family! Miss you!